On 22 November 2018, I embarked on a three-week research trip to China to start my work on the Shanghai History Museum/ Shanghai Revolution Museum and its decolonial practices. I would soon discover that the Museum is just one of the facets of the Communist Party’s plan to reframe the history of the area of the ex-Race Course. After working a few days in the Library of the Chinese University of Hong Kong and in the Hong Kong Museum of History, I arrived in Shanghai on November 25th, where I stayed until December 10th. I had two main goals for this fieldwork trip: first, I wanted to conduct research on the origins and development of the Shanghai History Museum/ Shanghai Revolution Museum (Shanghai Lishi Bowuguan/ Shanghai Geming Lishi Bowuguan, 上海历史博物馆/上海革命历史博物馆) (SHM); and second to interview specialists involved in the planning of the museum’s permanent exhibition. 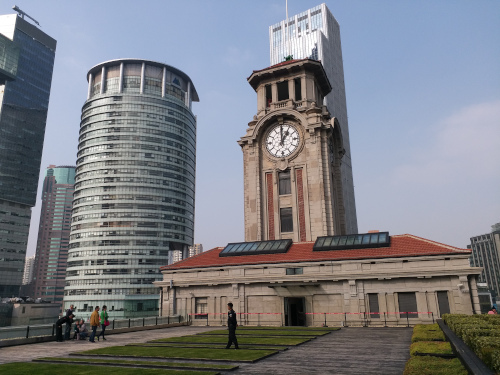 1.1 The rooftop of the Shanghai History Museum, once the club building of the Shanghai Race Club. Photo: Laura Pozzi. My first aim might seem straightforward at first, but in reality it absorbed most of my time and energy. The official guidebook of the SHM provides a summary of the museum’s history and of the most salient events that lead to its re-opening in March 2018. According to the book, a team of scholars devoted to the research and promotion of Shanghai’s history was established already in the 1950s. Plans to create a museum of the history of Shanghai (different from the prestigious Shanghai Museum, even if the history of the two organizations are strongly intertwined) remained on the agenda of the municipal government for years. Finally, in 1983 the Shanghai History Museum saw the light under the name ‘Shanghai Historical Artifacts Exhibition.’ After changing location several times, and after spending years without an official location, the museum re-opened its doors in 2018 under the name of Shanghai History Museum/Shanghai Revolution Museum in the ex-Shanghai Race Club on Nanjing West Road. While quite informative, the narrative offered by the SHM about its own history leaves several questions unanswered: How did the permanent exhibition change overtime? Why did the museum not have a permanent location between 1993 and 2018? Why does it have a double name, the Shanghai History Museum/Shanghai Revolution Museum? What does this naming imply? What happened to the artifacts collected by the team of scholars in the 1950s during the Cultural Revolution? Currently, the SHM does not have an archive about its own institutional history and only ‘internal workers’ can access data about the collection. Luckily, the Shanghai Library has plenty of resources (books, biographies, photo albums, etc) which allowed me to fill in some of the blanks in the SHM‘s history. 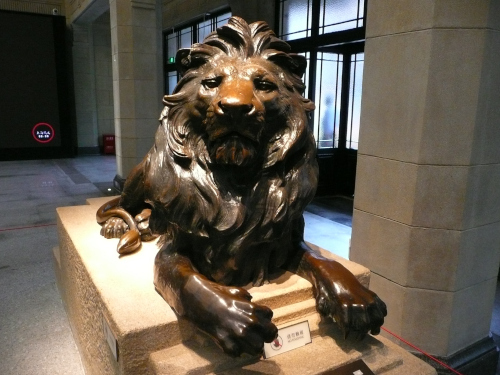 1.2 and 1.3 These bronze lions, called Steven and Stitt, were once placed at entrance of the HSBC (The Hong Kong and Shanghai Banking Corporation) Building on the Bund. During the Cultural Revolution, experts of the Shanghai Museum saved these statues from the iconoclastic violence of the Red Guards by storing them in warehouses. Steven and Stitt now welcome visitors at the entrance of the Shanghai History Museum. 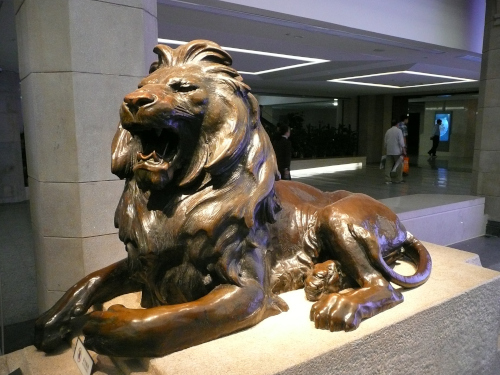 The audio-guide avoids discussing the events of the Cultural Revolution, focusing instead on the fact that the lions survived the assaults of Japanese troops during the WW2, when the Japanese soldiers melted several others bronze statues in the city. Photo: Laura Pozzi. While researching the history of the SHM, I also became interested in its building, the former clubhouse of the Shanghai Race Club, one of the most exclusive meeting spots in the city before 1949. Built in 1933 in neoclassical style, the clubhouse stood on the side of the twelve-acre race course, which had been opened at the center of the International Concession in 1862. After the establishment of the People’s Republic of China, Marshal Chen Yi (1901-1972), the new mayor of Shanghai, decided to transform the large racecourse into a park for the people of Shanghai – now known as People’s Park – and to open the exclusive clubhouse to the public. Starting in the early 1950s, the building hosted the Shanghai Museum (1950s), the Shanghai Library (1950s), and later the Shanghai Art Museum (2000-2012). The histories of the SHM and the Race Club are entangled, and I believe that an analysis of the making of the premises of the Race Club into People’s Park is by itself a valuable case study to gain insight into the city’s practices concerning its colonial heritage. Besides researching the history of the museum and its building, during my research trip I managed to interview some of the experts who worked on the SHM’s permanent exhibitions. ECHOES’s partners from the Department of Cultural Heritage and Museology at Fudan University assisted me by arranging interviews with the SHM’s Vice-Director Prof. Qiu Zhengping and with Prof. Lu Jiansong, the main curator behind the design of the permanent exhibition. My meeting with Prof. Lu was particularly helpful, as he explained how the exhibition was created and its aims. The permanent exhibition follows the history of the city from its inception until 1949, the year of the establishment of the People’s Republic of China. 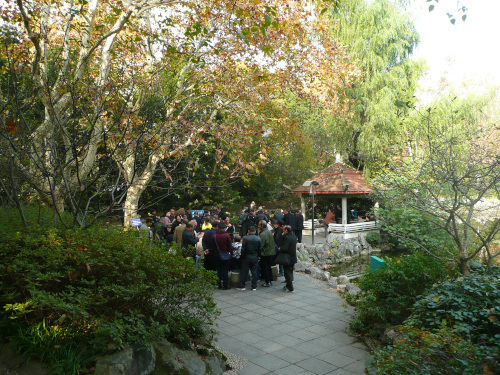 It is divided into two main sections (Shanghai Antiquity and Modern Shanghai), subdivided into thematic galleries. The collection contains more than 30,000 objects, most of which from the colonial history of the city. Prof. Lu provided useful insights on the discussions about the content and aims of the exhibition and the problem he faced while designing it. Besides talking with the senior staff and upper management of the SHM, I also started to engage with people who work in the museum on a daily basis. During my last visit, I talked with three volunteers who give tours to visitors. They were glad to share their experience with a laowai 老外 (foreigner) and proved to be a precious source of information about the activities of the museum. I plan to organize more structured interviews with them in the future. In conclusion, there is still a lot of work to be done to understand the history of the museum and the ways in which it is managed, but I believe that, with patience and time, I will be able to discover more about the inner workings of the museum and its decolonial practices. 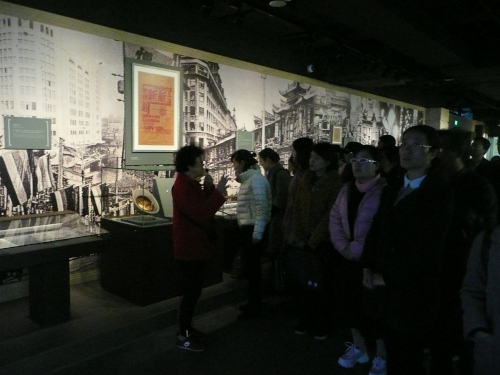 1.5 A volunteer (in red) guiding a group of visitors through the second floor of the Modern Shanghai section of the SHM. Photo: Laura Pozzi.